"State officials announced Thursday that $2.4 billion from increases in the gas tax and vehicle fees will be spent on dozens of transit projects, including work to prepare Southern California for the 2028 Summer Olympics," report Patrick McGreevy and Laura J. Nelson for the Los Angeles Times on April 26. The funds were made possible by the passage of SB 1, the Road Repair and Accountability Act of 2017, last April, hiking gas taxes 12 cents per gallon and diesel taxes by 20 cents, effective Nov. 1, 2017. The state's cap-and-trade program had fallen on hard times, but the passage of AB 398 last July, which extends the program through 2030, and a positive outcome on litigation last July, have made for a brighter future for the only state-run carbon trading program in the nation. 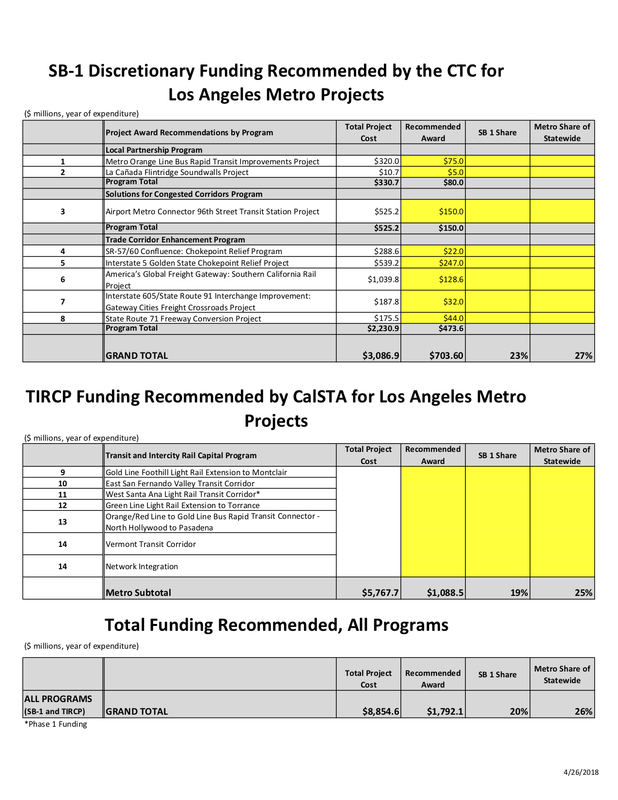 The money will go to six [Los Angeles County] Metropolitan Transit Authority expansion projects [jpg], including light-rail extensions to Torrance and Montclair, and additional rapid transit service along congested corridors, according to the California State Transportation Agency, which allocated the money. That amounts to $1.792 billion, reports Steve Hymon for The Source, Metro's blog. "The California Transportation Commission is scheduled to adopt the funding awards at its meeting on May 16 and 17...Many of the projects recommended for funding are part of the [$120 Billion] Measure M Expenditure Plan — as we’ve said before, having local funding helps attract state and federal funding." As for the rail and transit projects being transformative, those are the words of the California State Transportation Agency (CalSTA). The $2.6 billion for 28 recipients [pdf] from the new Transit and Intercity Rail Capital Program will fund "transformative capital improvements that modernize California’s intercity rail, bus, ferry and rail transit systems." They need to reduce greenhouse gas emissions as they tap the Greenhouse Gas Reduction Fund. McGreevy pens a separate article, also on April 26, about the gas tax repeal initiative. Sen. Jim Beall (D-San Jose), the author of SB 1, was asked about that threat at a press conference on Thursday, reports Melanie Curry for Streetsblog California. Michael Cabanatuan reports for the San Francisco Chronicle on other major transportation projects in the Bay Area to receive funding from the CalSTA grants.